Edition c. 20. Signed and titled in ink. Annotated $15.00 in the artist's hand, in ink, in the bottom right sheet edge. Image size 11 1/4 x 13 3/4 inches (286 x 349 mm); sheet size 15 7/8 x 22 5/8 inches (403 x 575 mm). A fine impression, on cream wove paper, with full margins (1 5/8 to 4 5/8 inches). Toning from cardboard backing recto, not visible verso, otherwise in excellent condition. The newspaper headline reads 'WAR". Ex-Kennedy Galleries Collection, with the original gallery mat. 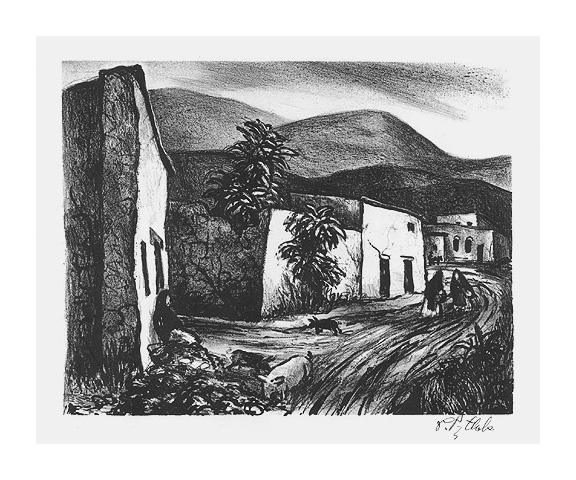 Untitled (Adobe Village)--- c. 1940, Lithograph. Edition not stated. Signed in pen. Image size 9 3/8 x 11 15/16 inches (239 x 308 mm); sheet size 13 1/8 x 16 1/2 inches (333 x 419 mm). A fine, rich impression, with full margins (1 5/8 x 2 1/2 inches), on cream wove paper. Brown paper tape in the four sheet corners, recto; pale light toning, otherwise in excellent condition.